Our Pilates Master Trainer certification program is the most comprehensive in the Pilates Industry as we have our unique and very effective Pilates equipment. 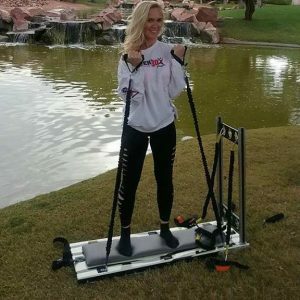 Our Powerboard Pilates equipment goes together with the Pilates Master Trainer Certification. We teach 10 levels of Pilates with comprehensive anatomy, plus the Powerboard Pilates System. Each level is completed over the course of two – five weekends. Our 300 hours program consists of weekend courses, self-practice, client teaching, taking classes and private training observation. Our Pilates Master Trainer program is designed to create thoughtful, creative and successful Pilates Master Trainers. Our Academy’s owner/ director has over 20 years experience in the field of Pilates, nutrition, health and exercise physiology. Marianna Jackson was the first who started to teach the Pilates technique in Hungary, Budapest. Our instructors have a wide variety of Pilates backgrounds from the original teachings of Joseph Pilates to modern techniques and have years of collective experience in Pilates instruction. Our students have come from all over the world to learn the art of Pilates in our training centers. Our graduates are working worldwide and are highly regarded in the industry. Learn over 350 Pilates exercises taking all of the 10 Pilates levels. Learn more about the nutrition, stretching, anatomy. To get your Pilates Master Trainer certification, you must take the following courses and participate in the anatomy lectures. You will receive 10 certifications plus the Pilates Master Trainer certification! Join us and become a Certified Pilates Master Trainer!